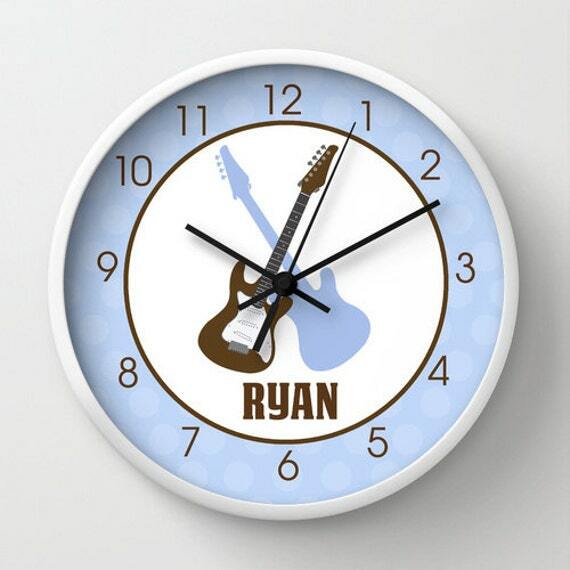 Super cool ROCK STAR Guitar is personalized for you at time of order, and makes a great nursery or baby shower gift. Would look great in any baby girl nursery, toddler room, playroom or bathroom! Our original artwork is a fun way to decorate any child's wall. These are our premium 10" diameter unique Wall Clocks, and feature a high-impact plexiglass crystal face and a backside hook for easy hanging. Choose black or white hands to match your wall clock frame and art design choice. Clock sits 1.75" deep and requires 1 AA battery (not included). These are soft tick clocks and do not have a noisy mechanism! Made in California, USA. Enter the name you would like on the clock in the "notes to seller" section when making your purchase. Please include the exact spelling as you would like it to appear on the clock. Upon receiving the clock, please insert a AA battery and test the clock. If you should have a malfunctioning unit (this occasionally happens during shipping), please contact us immediately. We can only replace malfunctioning clocks within 14-days of purchase.